Macau (; 澳門; 澳门; literally: "Bay Gate"), also spelled Macao, officially the Macao Special Administrative Region of the People's Republic of China, is an autonomous region on the western side of the Pearl River estuary in East Asia. Macau is bordered by the city of Zhuhai in Mainland China to the north and the Pearl River Delta to the east and south. Hong Kong lies about 64 kilometres (40 mi) to its east across the Delta. With a population of 650,900 living in an area of 30.5 km2 (11.8 sq mi), it is the most densely populated region in the world. A former Portuguese colony, it was returned to Chinese sovereignty on 20 December 1999. Macau was administered by the Portuguese Empire and its inheritor states from the mid-16th century until late 1999, when it constituted the last remaining European colony in Asia. Portuguese traders first settled in Macau in the 1550s. In 1557, Macau was leased to Portugal from Ming China as a trading port. The Portuguese Empire administered the city under Chinese authority and sovereignty until 1887, when Macau, through a mutual agreement between the two countries, became a colony. Sovereignty over Macau was transferred back to China on 20 December 1999. The Joint Declaration on the Question of Macau and Macau Basic Law stipulate that Macau operate with a high degree of autonomy until at least 2049, fifty years after the transfer. Macau is a resort city in Southern China, known for its casinos and luxury hotels. Its gaming revenue has been the world's largest since 2006, with the economy heavily dependent on gaming and tourism. According to The World Factbook, Macau has the fourth highest life expectancy in the world. Moreover, it has a "very high Human Development Index", ranking 18th in the world as of 2014. Macau is among the world's richest regions, and as of 2015 its GDP per capita by purchasing power parity is higher than that of any country in the world, according to the World Bank. It is widely known as the pre-eminent gambling (or gaming) capital of the world, greatly dwarfing other gambling centers/cities. The present Chinese name (Chinese: 澳門; pinyin: Àomén; Cantonese Yale: Oumún) means "Bay Outlet". Macau is otherwise known in Chinese as Haojing (濠鏡, literally "Oyster Mirror") or Jinghai (鏡海, literally "Mirror Sea"). The name Macau is thought to be derived from the A-Ma Temple (Chinese: 媽閣廟; pinyin: Māgé Miào; Cantonese Yale: Māgok Miuh), a temple built in 1448 dedicated to Mazu, the goddess of seafarers and fishermen. More precisely, the name Macau corresponds to the Chinese name "媽港" (pinyin: Magang), meaning "Harbor of Mazu", and referring to the waters adjacent to the Ama Temple. The history of Macau is traced back to the Qin dynasty (221–206 BC), when the region now called Macau came under the jurisdiction of Panyu County, Nanhai Prefecture (modern Guangdong). The first recorded Chinese inhabitants of the area were people seeking refuge in Macau from invading Mongols during the Southern Song. Under the Ming dynasty (1368–1644), fishermen migrated to Macau from Guangdong and Fujian. The Macau native people were Tanka boat people. 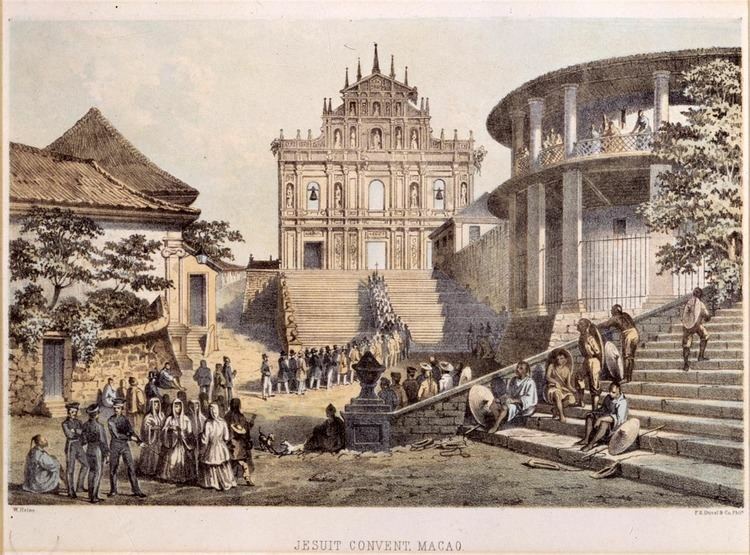 Macau did not develop as a major settlement until the Portuguese arrived in the 16th century. In 1513, Jorge Álvares became the first Portuguese to land in China. In 1535, Portuguese traders obtained the rights to anchor ships in Macau's harbours and to carry out trading activities, though not the right to stay onshore. Around 1552–1553, they obtained temporary permission to erect storage sheds onshore, in order to dry out goods drenched by sea water; they soon built rudimentary stone houses around the area now called Nam Van. In 1557, the Portuguese established a permanent settlement in Macau, paying an annual rent of 500 taels (18.9 kilograms / 41.6 pounds) of silver. The Portuguese continued to pay an annual tribute up to 1863 in order to stay in Macau. By 1564, Portugal commanded western trade with India, Japan, and China. In 1631 the Chinese restricted Portuguese commerce in China to the port of Macau. During the 17th century, some 5,000 slaves lived in Macau, in addition to 2,000 Portuguese and 20,000 Chinese. As more Portuguese settled in Macau to engage in trade, they made demands for self-administration; but this was not achieved until the 1840s. In 1576, Pope Gregory XIII established the Roman Catholic Diocese of Macau. In 1583, the Portuguese in Macau were permitted to form a Senate to handle various issues concerning their social and economic affairs under strict supervision of the Chinese authority, but there was no transfer of sovereignty. Macau prospered as a port but it was the target of repeated failed attempts by the Dutch to conquer it in the 17th century. On 24 June 1622, the Dutch attacked Macau in the Battle of Macau, in the hope of turning it into a Dutch possession. The Portuguese repulsed their attack and the Dutch never tried to conquer Macau again. The majority of the defenders were African slaves, with only a few Portuguese soldiers and priests. Captain Kornelis Reyerszoon was commander of the 800-strong Dutch invasion force. The grieving Dutch Governor Jan Pz. Coen said after the defeat that "The slaves of the Portuguese at Macau served them so well and faithfully, that it was they who defeated and drove away our people there last year", and "Our people saw very few Portuguese" during the battle. Following the First Opium War (1839–42), Portugal occupied the empty islands of Taipa and Coloane in 1851 and 1864 respectively. On 1 December 1887, the Qing and Portuguese governments signed the Sino-Portuguese Treaty of Peking, under which China ceded the right of "perpetual occupation and government of Macau by Portugal" in compliance with the statements of the Protocol of Lisbon. In return, Macau Government would cooperate with Hong Kong's smuggling trade in Indian opium and China would profit from imposing customs taxes. Portugal was also obliged "never to alienate Macau without previous agreement with China", therefore ensuring that negotiation between Portugal and France (regarding a possible exchange of Macau and Portuguese Guinea with the French Congo) or with other countries would not go forward – so that the British commercial interests would be secured; Macau officially became a territory under Portuguese administration. In 1928, after the Qing dynasty had been overthrown following the Xinhai Revolution, the Kuomintang (KMT) government officially notified Portugal that it would abrogate the Treaty of Amity and Commerce; the two powers signed a new Sino-Portuguese Friendship and Trade Treaty in place of the abrogated treaty. Changing only a few provisions concerning tariff principles and matters relating to business affairs, the new treaty did not alter the sovereignty of Macau and Portuguese government of Macau remained unchanged. During World War II, unlike Portuguese Timor, which was occupied by the Japanese in 1942 along with Dutch Timor, the Japanese respected Portuguese neutrality in Macau, but only up to a point. Macau enjoyed a brief period of economic prosperity as the only neutral port in South China after the Japanese had occupied Guangzhou and Hong Kong. In August 1943, Japanese troops seized the British steamer Sian in Macau and killed about 20 guards. The next month they demanded the installation of Japanese "advisors" under the threat of overt military occupation. The result was that a virtual Japanese protectorate was created over Macau. When it was discovered that "neutral" Macau was planning to sell aviation fuel to Japan, aircraft from the USS Enterprise bombed and strafed the hangar of the Naval Aviation Centre on 16 January 1945 to destroy the fuel. American air raids on targets in Macau were also made on 25 February and 11 June 1945. Following Portuguese government protests, in 1950 the United States paid US$20,255,952 to the government of Portugal. Between the end of the Pacific War and the establishment of the People's Republic of China, Macau served as a safe haven for refugees of the Chinese Civil War. After the establishment of the People's Republic of China in 1949, the Beijing government declared the Sino-Portuguese Treaty invalid as an "unequal treaty" imposed by foreigners on China. However, Beijing was not ready to settle the treaty question, allowing the maintenance of "the status quo" until a more appropriate time. Influenced by the Cultural Revolution in mainland China and by general dissatisfaction with Portuguese government, riots broke out in Macau in 1966. In the most serious, the so-called 12-3 incident, 6 people were killed and more than 200 people were injured. On 28 January 1967, the Portuguese government issued a formal apology by means of an "admission of guilt". Shortly after Portugal's 1974 Carnation Revolution, which overthrew the Estado Novo dictatorship, the new government determined it would relinquish all its overseas possessions. 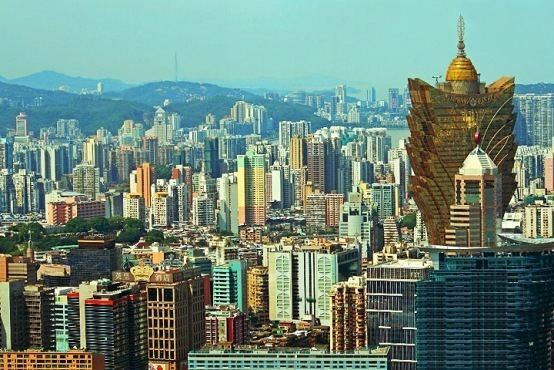 In 1976, Lisbon redefined Macau as a "Chinese territory under Portuguese administration" and granted it a large measure of administrative, financial, and economic autonomy. Three years later, Portugal and China agreed to regard Macau as "a Chinese territory under [temporary] Portuguese administration". The Chinese and Portuguese governments commenced negotiations on the question of Macau in June 1986. The two signed the Sino-Portuguese Joint Declaration the next year, making Macau one of the special administrative regions of China. The Chinese government assumed formal sovereignty over Macau on 20 December 1999 as a special administrative region (SAR) after over 400 years of Portuguese colonial rule. This event also marked the end of the Portuguese Empire and European colonialism in Asia. The economy since then has continued to prosper with the sustained growth of tourism from mainland China and the construction of new casinos. The Sino-Portuguese Joint Declaration and Macau Basic Law, Macau's constitution, promulgated by China's National People's Congress in 1993, specify that Macau's social and economic system, lifestyle, rights, and freedoms are to remain unchanged for at least 50 years after the transfer of sovereignty to China in 1999. Under the principle of "one country, two systems", Macau enjoys a high degree of autonomy in all areas except defence and foreign affairs. Macau officials, rather than PRC officials, run Macau through the exercise of separate executive, legislative, and judicial powers, as well as the right to final adjudication. Macau maintains its own currency (the Macanese pataca), customs territory, immigration and border controls and police force. The government in Macau is headed by the Chief Executive of Macau, who is appointed by the central government upon the recommendation of an election committee, whose three hundred members are nominated by corporate and community bodies. The recommendation is made by an election within the committee. The chief executive's cabinet is made up of five policy secretaries and is advised by the Executive Council of Macau, which has between seven and eleven members. Edmund Ho, a community leader and former banker, was the first chief executive of the Macau SAR, replacing General Vasco Rocha Vieira at midnight on 20 December 1999. Fernando Chui is the current Chief Executive. The chief executive and the cabinet have their offices in the Macau Government Headquarters, located in the area of São Lourenço. The legislative organ of the territory is the Legislative Assembly, a 33-member body comprising 14 directly elected members, 12 indirectly elected members representing functional constituencies and seven members appointed by the chief executive. Any permanent residents at or over 18 years of age are eligible to vote in direct elections. Indirect election is limited to organizations registered as "corporate voters" and a 300-member election committee drawn from broad regional groupings, municipal organizations, and central government bodies. In February 2009, the Legislative Assembly passed the Macau national security law based on a withdrawn security legislation previously introduced in Hong Kong. Democracy advocates feared that the bill's excessively broad scope could lead to abuses, a concern which has been heightened after a number of prominent supporters of democracy in Hong Kong were denied entry into Macau in the run-up to the bill's passage. The original framework of the legal system, based largely on the Law of Portugal, the Portuguese civil law system, was preserved after 1999. The territory has its own independent judicial system with a High Court. Judges are selected by a committee and appointed by the chief executive. Foreign judges may serve on the courts. Macau has a three-tier court system: the Court of the First Instance, the Court of the Second Instance and the Court of Final Appeal. Under Portuguese rule, Macau often served as an expeditionary base to Japan and other regions of East Asia from the 16th century onwards, while maintaining a strong garrison mainly to repel Dutch and mainland Chinese attacks. However, since the allied British settled Hong Kong, the need for a strong military presence in Macau dimmed and it became limited before ceasing in 1974. However, despite having no Portuguese garrison left on the territory, a small security force managed by the local PSP was kept, which proved useful with the escalating triad warfare tensions towards the last decades of Portuguese administration. Also the Capitania dos Portos kept operating a coast guard and the Portuguese airforce kept airfields active until the opening of Macau International Airport in the mid-1990s. In 1999, upon handover to the PRC, a substantial garrison of the People's Liberation Army was established in the city helping deliver the last blow to the violence perpetrated by the triads, who were weakened by police action and arrests prior to the handover. The garrison remains, with a large portion of the forces stationed in neighbouring Zhuhai as well. Macau is divided into 8 parishes. Macau is situated 60 kilometres (37 mi) southwest of Hong Kong and 145 kilometres (90 mi) from Guangzhou of Mainland China. It also has 41 kilometres (25 mi) of coastline, yet only 310 metres (1,000 ft) of land border with Guangdong of Mainland China. It consists of the Macau Peninsula itself and the islands of Taipa and Coloane, which are now connected by landfill forming Cotai. The peninsula is formed by the Zhu Jiang (Pearl River) estuary on the east and the Xi Jiang (West River) on the west. It borders the Zhuhai Special Economic Zone in mainland China. The main border crossing between Macau and China is known as the Portas do Cerco (Barrier Gate) on the Macau side, and the Gongbei Port of Entry on the Zhuhai side. Macau Peninsula was originally an island, but a connecting sandbar gradually turned into a narrow isthmus. Land reclamation in the 17th century transformed Macau into a peninsula with generally flat terrain, though numerous steep hills still mark the original land mass. Alto de Coloane is the highest point in Macau, with an altitude of 170.6 metres (559.7 ft). With a dense urban environment, Macau has no arable land, pastures, forest, or woodland. In 2015, the Chinese government assigned Macau administrative responsibility for 85 km2 (33 sq mi) of coastal ocean area. Macau has a humid subtropical climate (Köppen Cwa), with average relative humidity between 75% and 90%. Similar to much of South China, seasonal climate is greatly influenced by the monsoons, and differences in temperature and humidity between summer and winter are noticeable, though not as great as in mainland China. The average annual temperature of Macau is 22.7 °C (72.9 °F). July is the warmest month, the average temperature being 28.9 °C (84.0 °F). The coolest month is January, with a mean temperature of 14.5 °C (58.1 °F). Located on China's southern coast, Macau has ample rainfall, with average annual precipitation being 2,120 millimetres (83 in). However, winter is mostly dry due to the influence of the vast Siberian High affecting much of East Asia. Autumn in Macau, from October to November, is sunny and still pleasantly warm with lower humidity. Winter (December to early March) is generally mild with temperatures above 13 °C (55 °F) most of the time, although it can drop below 8 °C (46 °F) at times. Humidity starts to increase from late March. Summer is very warm to hot (often rising above 30 °C (86 °F) during the day). The hot weather is often followed by heavy rain, thunderstorms and occasional typhoons. Macau is a founding member of the WTO and has maintained sound economic and trade relations with more than 120 countries and regions, with European Union and Portuguese-speaking countries in particular; Macau is also a member of the IMF. The World Bank classifies Macau as a high income economy and the GDP per capita of the region in 2006 was US$28,436. After the Handover in 1999, there has been a rapid rise in the number of mainland visitors due to China's easing of travel restrictions. Together with the liberalization of Macau's gaming industry in 2001 that induces significant investment inflows, the average growth rate of the economy between 2001 and 2006 was approximately 13.1% annually. In a World Tourism Organization report of international tourism for 2006, Macau ranked 21st in the number of tourists and 24th in terms of tourism receipts. From 9.1 million visitors in 2000, arrivals to Macau has grown to 18.7 million visitors in 2005 and 22 million visitors in 2006, with over 50% of the arrivals coming from mainland China and another 30% from Hong Kong. Starting in 1962, the gambling industry had been operated under a government-issued monopoly license by Stanley Ho's Sociedade de Turismo e Diversões de Macau. The monopoly ended in 2002 and several casino owners from Las Vegas attempted to enter the market. With the opening of the Sands Macao, in 2004 and Wynn Macau in 2006, gambling revenues from Macau's casinos grew considerably prosperous. In 2007, Venetian Macau, at the time the second (in 2017 is seventh) largest building in the world by floor area, opened its doors to the public, followed by MGM Grand Macau. Numerous other hotel casinos, including Galaxy Cotai Megaresort, opened in 2011, and plans for a $3.9 billion complex that will be known as Lisboa Palace is expected to be completed by 2017. In February 2015, the gambling revenue in Macau fell by 48.6 percent from a year earlier to 19.5 billion patacas ($2.4 billion), the biggest monthly decline that has ever been recorded. Reasons for this fall of revenue are related to the slowdown that the Chinese economy is having and a corruption crackdown by Chinese officials which has constrained lavish spending. In 2002, the Macau government ended the monopoly system and six casino operating concessions and subconcessions are granted to Sociedade de Turismo e Diversões de Macau, Wynn Resorts, Las Vegas Sands, Galaxy Entertainment Group, the partnership of MGM Mirage and Pansy Ho (daughter of Stanley Ho), and the partnership of Melco and Publishing and Broadcasting Limited (PBL). Today, there are 16 casinos operated by the STDM, and they are still crucial in the casino industry in Macau, but in 2004, the opening of the Sands Macau ushered in the new era. Gambling revenue has made Macau the world's top casino market, surpassing Las Vegas. The amount of performances performed in Macau has also shown an increasing trend since the early 2010s, including the show House of Dancing Water, concerts, industry trade shows and international art crossovers. Macau is an offshore financial centre, a tax haven, and a free port with no foreign exchange control regimes. The Monetary Authority of Macau regulates offshore finance, while the Macau Trade and Investment Promotion Institute provides services for investment in Macau. In 2007, Moody's Investors Service upgraded Macau's foreign and local currency government issuer ratings to 'Aa3' from 'A1', citing its government's solid finances as a large net creditor. The rating agency also upgraded Macau's foreign currency bank deposit ceiling to 'Aa3' from 'A1'. As prescribed by the Macau Basic Law, the government follows the principle of keeping expenditure within the limits of revenues in drawing up its budget, and strives to achieve a fiscal balance, avoid deficits and keep the budget commensurate with the growth rate of its gross domestic product. All financial revenue of the Macau Special Administrative Region shall be managed and controlled by the region itself and shall not be handed over to the Central People's Government. The Central People's Government shall not levy any taxes in the Macau Special Administrative Region. In Macau, the unit of currency is the pataca, which is currently pegged to the Hong Kong dollar at a rate of HK$1 = MOP1.03. The name pataca is a Portuguese word which was applied to the Mexican dollars that were the main circulating coin in the wider region in the second half of the 19th century. In 1894, the pataca was introduced in both Macau and Portuguese Timor as a unit of account for the Mexican dollar and the other silver dollar coins in circulation. However, the pataca was not the official currency when it was first enacted. In 1901, it was decided to grant the Banco Nacional Ultramarino the exclusive rights to issue banknotes denominated in patacas, and in the year 1906, all foreign coins were outlawed. However, the Chinese were suspicious of these paper patacas, being so accustomed to using silver for barter, and as such, the paper patacas circulated at a discount in relation to the silver dollar coins.In 1935, when China and Hong Kong abandoned the silver standard, the Hong Kong dollar was pegged to sterling at the fixed rate of 1 shilling and 3 pence, whereas the pataca was pegged to the Portuguese escudo at a sterling equivalent rate of only 1 shilling. From 1945 to 1951, fractional coins of the pataca were minted for issue in Portuguese Timor; and, in 1952, similar issues were minted for Macau including an actual pataca coin for the first time. Macau is the most densely populated region in the world, with a population density of 21,400 persons per square kilometre in 2016. Han Chinese make up 95% of Macau's population; another 2% is of Portuguese and/or mixed Chinese/Portuguese descent, an ethnic group often referred to as Macanese. According to the 2006 by-census, 47% of the residents were born in mainland China, of whom 74.1% were born in Guangdong and 15.2% in Fujian. Meanwhile, 42.5% of the residents were born in Macau, and those born in Hong Kong, the Philippines and Portugal shared 3.7%, 2.0% and 0.3% respectively. The growth of population in Macau mainly relies on immigrants from mainland China and the influx of overseas workers since its birth rate is one of the lowest in the world. According to The World Factbook, Macau has the fourth highest life expectancy in the world, while its infant mortality rate ranks among the lowest in the world. Macau's official languages are Chinese (Cantonese) and Portuguese. Macau still retains its own dialect of Portuguese, called Macanese Portuguese. Other languages—such as Mandarin, English, and Hokkien—are spoken by local communities. The Macanese language, a distinctive creole generally known as Patuá, is still spoken by several dozen Macanese. Since Macau has an economy driven by tourism, 14.6% of the workforce is employed in restaurants and hotels, and 10.3% in the gambling industry. With the opening of several casino resorts and other major constructions underway, many sectors reportedly experience a shortage of labour, and the government seeks to import labour from neighbouring regions. The number of imported workers stood at a record high of 98,505 in the second quarter of 2008, representing more than 25% of the labour force in Macau. Some local workers complain about the lack of jobs due to the influx of cheap imported labour. Some also claim that the problem of illegal labour is severe. Another concern is the widening of income inequality in the region. Macau's Gini coefficient, a popular measure of income inequality where a low value indicates a more equal income distribution, rose from 0.43 in 1998 to 0.48 in 2006. It is higher than those of neighbouring regions, such as mainland China (0.447), South Korea (0.316) and Singapore (0.425). Most Chinese in Macau are profoundly influenced by their own tradition and culture, of which most take part in Chinese folk religion, in which Taoism and Confucianism are comprehended. According to a survey conducted between 2005, 2007 and 2009, 55% of the population do not declare religious affiliation, 30% follows folk faiths, 10% are adherents of Buddhism or Taoism, and the remaining 5% part are Christians . There is also a considerable community of Christians in Macao, most of whom are members of the Catholic Church, which is organized and structured in Macau in the Diocese of Macau, founded in 1576. At present, Macau has about 30,100 Catholics. Macau residents are endowed with considerable religious tolerance and freedom. A fifteen-year free education is currently being offered to residents, that includes a three-year kindergarten, followed by a six-year primary education and a six-year secondary education. The literacy rate of the territory is 93.5%. The illiterates are mainly among the senior residents aged 65 or above; the younger generation, for example the population aged 15–29, has a literacy rate of above 99%. Currently, there is only one school in Macau where Portuguese is the medium of instruction, Macau Portuguese School. Macau does not have its own region-wide education system; non-tertiary schools follow either the British, the Chinese, or the Portuguese education system. There are currently 10 tertiary educational institutions in the region, four of them being public. In 2006, the Programme for International Student Assessment, a worldwide test of 15-year-old schoolchildren's scholastic performance coordinated by OECD, ranked Macau as the fifth and sixth in science and problem solving respectively. Nevertheless, educational attainment in Macau is relatively low when compared to other high income countries. According to the 2006 by-census, among the resident population aged 14 and above, only 51.8% has a secondary education and 12.6% has a tertiary education. As prescribed by the Basic Law of Macau Chapter VI Article 121, the Government of Macau shall, on its own, formulate policies on education, including policies regarding the educational system and its administration, the language of instruction, the allocation of funds, the examination system, the recognition of educational qualifications, and the system of academic awards so as to promote educational development. The government shall also in accordance with law, gradually institute a compulsory education system. Community organizations and individuals may, in accordance with law, run educational undertakings of various kinds. Macau is served by one major public hospital, the Hospital Conde S. Januário, and one major private hospital, the Hospital Kiang Wu, both located in Macau Peninsula, as well as a university associated hospital called Macau University of Science and Technology Hospital in Cotai. In addition to hospitals, Macau also has numerous health centres providing free basic medical care to residents. Consultation in traditional Chinese medicine is also available. None of the Macau hospitals are independently assessed through international healthcare accreditation. There are no western-style medical schools in Macau, and thus all aspiring physicians in Macau have to obtain their education and qualification elsewhere. Local nurses are trained at the Macau Polytechnic Institute and the Kiang Wu Nursing College. Currently there are no training courses in midwifery in Macau. A study by the University of Macau, commissioned by the Macau SAR government, concluded that Macau is too small to have its own medical specialist training centre. The Macau Corps of Firefighters (Portuguese: Corpo de Bombeiros de Macau) is responsible for ambulance service (Ambulância de Macau). The Macau Red Cross also operates ambulances (Toyota HiAce vans) for emergency and non-emergencies to local hospitals with volunteer staff. The organization has a total of 739 uniformed firefighters and paramedics serving from 7 stations in Macau. The Health Bureau in Macau is mainly responsible for coordinating the activities between the public and private organizations in the area of public health, and assure the health of citizens through specialized and primary health care services, as well as disease prevention and health promotion. The Macau Centre for Disease Control and Prevention was established in 2001, which monitors the operation of hospitals, health centres, and the blood transfusion centre in Macau. It also handles the organization of care and prevention of diseases affecting the population, sets guidelines for hospitals and private healthcare providers, and issues licences. As of 2016 Macau healthcare authorities send many patients to Queen Mary Hospital in Hong Kong in certain cases, and many Macau residents intentionally seek healthcare in Hong Kong because they place more trust in Hong Kong doctors than in Mainland-trained doctors operating in Macau. In Macau, traffic drives on the left, unlike in either mainland China or Portugal, but like neighbouring Hong Kong. Macau has a well-established public transport network connecting the Macau Peninsula, Cotai, Taipa Island and Coloane Island. Buses and taxis are the major modes of public transport in Macau. Currently three companies – Transmac, Transportas Companhia de Macau and Macau Nova Era de Autocarros Públicos operate franchised public bus services in Macau. The trishaw, a hybrid of the tricycle and the rickshaw, is also available, though it is mainly for sightseeing purposes. The newest public bus operator, Macau Nova Era, previously Reolian Public Transport Co., entered service on 1 August 2011. This new bus operator operates on the existing routes by Transmac and Transportas Companhia de Macau. Free Casino Shuttle Buses are everywhere in Macau. Due to tourism being the main economic industry in Macau a majority of the larger hotels provide free round trip shuttle bus services which cover the major tourist sites including the airport, Outer Harbour Ferry Terminal, Taipa Temporary Ferry Terminal and other sites. Some Larger hotels such as Venetian Hotel and Holiday Inn even provide a free shuttle between them. The frequency for each route is usually 15 minutes. The taxi system is noted for having a notoriously poor reputation among tourists and even locals. Common complaints include "constant overcharging, refusal of passengers when the destination or passenger type does not suit the driver, circuitous routes and even violent behaviour." In recent years, the Macau government have been making attempts to hold drivers to a higher standard of service through methods such as undercover police prosecuting drivers who violate the taxi regulations on the spot. The Outer Harbour Ferry Terminal and the Taipa Temporary Ferry Terminal provides cross-border transportation services for passengers travelling between Macau and Hong Kong, while the Yuet Tung Terminal in the Inner Harbour serves those travelling between Macau and cities in mainland China, including Shekou and Shenzhen. The Macau Light Rapid Transit or Macau LRT also known as Metro Ligeiro de Macau is a mass transit system in Macau under construction. It will serve the Macau Peninsula, Taipa and Cotai, serving major border checkpoints such as the Border Gate, the Outer Harbour Ferry Terminal, the Lotus Bridge Border and the Macau International Airport. It is planned to open in 2019. Macau has one active international airport, known as Macau International Airport located at the eastern end of Taipa and neighbouring waters. The airport used to serve as one of the main transit hubs for passengers travelling between mainland China and Taiwan, but now with the introduction of direct flights between those two regions, passenger traffic in this regard has lessened. It is the primary hub for Air Macau. In 2006, the airport handled about 5 million passengers. 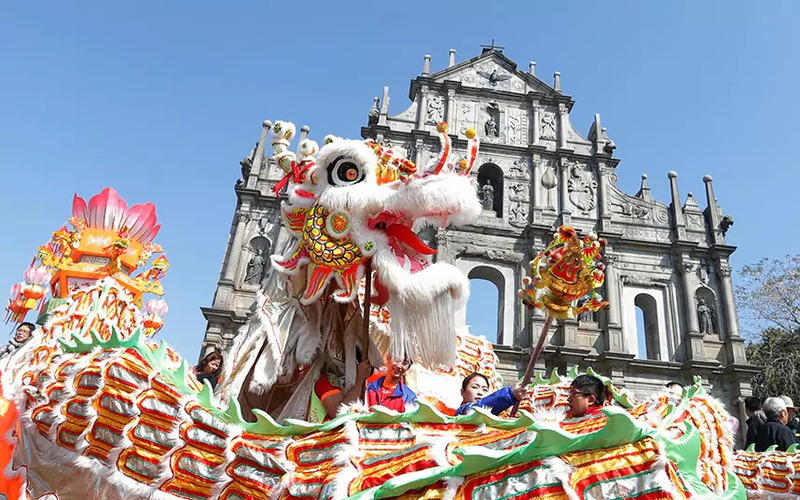 The mixing of the Chinese and Portuguese cultures and religious traditions for more than four centuries has left Macau with an inimitable collection of holidays, festivals and events. The biggest event of the year is the Macau Grand Prix in November, when the main streets in Macau Peninsula are converted to a racetrack bearing similarities with the Monaco Grand Prix. Other annual events include Macau Arts festival in March, the International Fireworks Display Contest in September, the International Music festival in October and/or November, and the Macau International Marathon in December. The Lunar Chinese New Year is the most important traditional festival and celebration normally takes place in late January or early February. The Pou Tai Un Temple in Taipa is the place for the Feast of Tou Tei, the Earth god, in February. The Procession of the Passion of Our Lord is a well-known Roman Catholic rite and journey, which travels from Saint Austin's Church to the Cathedral, also taking place in February. A-Ma Temple, which honours the Goddess Matsu, is in full swing in April with many worshippers celebrating the A-Ma festival. In May it is common to see dancing dragons at the Feast of the Drunken Dragon and twinkling-clean Buddhas at the Feast of the Bathing of Lord Buddha. In Coloane Village, the Taoist god Tam Kong is also honoured on the same day. Dragon Boat festival is brought into play on Nam Van Lake in June and Hungry Ghosts' festival, in late August and/or early September every year. All events and festivities of the year end with Winter Solstice in December. Macau preserves many historical properties in the urban area. The Historic Centre of Macau, which includes some twenty-five historic locations, was officially listed as a World Heritage Site UNESCO on 15 July 2005 during the 29th session of the World Heritage Committee, held in Durban, South Africa. Local cooking in Macau consists of a blend of Cantonese and Portuguese cuisines. Many unique dishes resulted from the spice blends that the wives of Portuguese sailors used in an attempt to replicate European dishes. Its ingredients and seasonings include those from Europe, South America, Africa, India, and Southeast Asia, as well as local Chinese ingredients. Typically, Macanese food is seasoned with various spices and flavours including turmeric, coconut milk, cinnamon and bacalhau, giving special aromas and tastes. Famous dishes include minchi, capella, galinha à Portuguesa, galinha à Africana (African chicken), bacalhau, Macanese chili shrimps and stir-fry curry crab. Pork chop bun, ginger milk and Portuguese-style egg tart are also very popular in Macau. Macau has its own professional football league, the Campeonato da 1ª Divisão do Futebol, where the Big Three professional football clubs of Portugal have their own branches: S.L. Benfica de Macau, Sporting Clube de Macau and F.C. Porto de Macau. In general, football (soccer) has the greatest popularity in Macau, which has a representative international side, Macau national football team. Another common sport is rink hockey, which is often practised by the Portuguese. The national team of Macau is the most powerful of Asia, always participates in the Rink Hockey World Championship in B category and has many Rink Hockey Asian Championship titles. The last Championship was won in Lishui, China, at the 2016 Asian Roller Hockey Championship. Macau also has a basketball team, which qualified for the Asian Basketball Championship twice. The automobile racing event Macau Grand Prix is arguably the most important international sporting event in Macau, mainly with Formula 3, motorcycle road racing and touring car races. Since 1989, Macau owns a thoroughbred horse racing track called Taipa Racecourse operated by the Macau Jockey Club. The racecourse has a 15,000 seater grandstand.